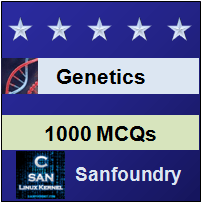 This set of Genetic Engineering Multiple Choice Questions & Answers (MCQs) focuses on “Cloning in Lambda-01”. 1. Insertion vectors are a type of vectors. Choose the correct statement for this type of vector. Explanation: Insertion vectors are the simple vectors and DNA is inserted through a single restriction site. It must be a non-essential gene to maintain phage viability. There is an upper limit on the size of the DNA to be packaged thus only a few kilobases of the extra DNA can be included. Lambda gt10 and gt11 are an example of insertion vectors. 2. Choose the correct statement for lambda gt10. Explanation: Lambda gt10 is having an EcoRI site which contains the cI repressor gene. It accepts an insert of size upto 7.6 kbp which is generally more than that of the size generally accepted by a wild type phage. 3. The presence of insert leads to inactivation of which gene? Explanation: The presence of insert leads to inactivation of cI gene and this is the method to detect the presence of an insert. Explanation: If a portion of phage is removed and in its place the DNA of interest is inserted, it is called as substitution or replacement vector. 5. Choose the incorrect statement for the central portion of lambda genome. Explanation: The central portion of lambda genome is approximately 20 kbp and it is not required for lytic growth. The central portion constitutes of repressor gene and thus it has to be removed for the lysogenic growth to take place. Explanation: The fragment inserted in the place of the central portion of genome is known as stuffer fragment. It is generated by doing partial digestion an enzyme having a 4bp long recognition site. 7. Choose incorrect statement for the substitution vector EMBL4. Explanation: The substitution vector EMBL4 contains two multiple cloning sites. The two multiple cloning sites flank the region which is to be removed. If digestion is done within the multiple cloning sites, it generates central portion and the right and left portions. The right and left portions separated are known as arms. 8. Is it necessary to stop the relegation of central portion before the stiffer fragment is ligated. The given statement is true or false? Explanation: The central portion should be stopped from religating before the stuffer fragment should be ligated. There are chances that central portion gets religated to the arms. 9. At times, a second enzyme is used while the central portion is removed and the stuffer fragment is placed there. Choose the statement which doesn’t holds for this process. Explanation: A second enzyme is used in order to avoid the relegation of central portion and the arms. In this method, the central portion is cut with a second enzyme after being separated from the arms. These arms are not cut with the second enzymes. Hence the ends created are different now and the arms won’t ligate to the central portion again. It is not necessary to remove the fragments generated because the chances of having a multimolecular reaction which are required for the formation of original phage are very less. 10. Physical separation is also used at times. Choose the correct statement in respect to this method. Explanation: Physical separation is also used at times, it constitutes of using gel electrophoresis or by using centrifugation in the sugar density gradient. In sugar density gradient, the separation is done on the basis of size. The arms are separated from the gel or gradient. Gradient is more efficient than gel, thus gradient is more preferred over gel. 11. Packaging in vitro is also carried out to introduce the lambda DNA into the cells. Choose the incorrect statement in respect to it. Explanation: Packaging in vitro is used to introduce the lambda. It is more efficient than the normal transformation procedure. Thus, the lambda DNA is incubated with lysate of lambda infected cells in a concatemeric configuration. This lysate constitutes of lambda proteins needed for phage assembly and hence the recombinant DNA is also packed. But there is also a large amount of non-recombinant packaging in the background. 12. Packaging in vitro is basically carried out by two different strategies. Choose the incorrect statement for it. Explanation: Packaging in vitro is basically out by two different strategies. In the first strategy, separate strains with chain-termination mutations in different genes (mostly D and E genes) for coat components are used. Temperature sensitive cI repressor is used and due to induction by heat shock, packaging proteins are produced. But packaging is not carried out in any of the strain because none of the strain is having full complement of proteins to carry out packaging. Explanation: Chain-termination mutations in coat proteins genes are carried out, these genes are D and E genes.